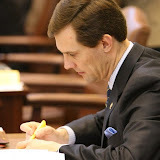 OKLAHOMA CITY – State Rep. Jason Nelson, R-Oklahoma City, issued the following statement on the State Supreme Court's decision today that House Bill 3399 that repealed Common Core is constitutional. Following a public hearing this morning, the Oklahoma Supreme Court issued a "Memorandum Opinion" this afternoon confirming the constitutionality of HB 3399. In its brief opinion the court stated, "HB 3399 is not unconstitutional under either art. 13, §5 or art. 4, §1 of the Oklahoma Constitution." Nelson was the House co-author of House Bill 3399. "The Supreme Court made the right decision today. I thought the justices asked great questions hitting all the salient points during the hearing this morning and I felt good about our case after the hearing. The arguments in favor of the constitutionality of the law are strong and left little doubt that the decision would be favorable. “I've believed from the beginning that this legal challenge was baseless and have said so since it was filed. The legal arguments against House Bill 3399 were thoroughly researched by the authors and determined to be baseless when the National Association of State School Boards, an out-of-state organization supporting the national implementation of the Common Core State Standards, first raised them in March. “I'm grateful to Attorney General Scott Pruitt and his staff, specifically Solicitor General Patrick Wyrick and Assistant Solicitor General Cara Rodriguez, for their outstanding legal defense of this legislative action. I'm also grateful to those individuals and organizations who voluntarily offered their perspectives to the Court by filing legal briefs in defense of the law. “The Court’s ruling today upholding the constitutionality of House Bill 3399 is a win for students, parents and teachers. “Solicitor General Patrick Wyrick masterfully relayed to the Court that the Board of Education, through Article 13, is given the authority to supervise instruction, emphasizing they may do so ‘as prescribed by law,’ akin to the way a construction project manager supervises an architect’s blueprints. “Today, the Court upheld HB 3399 on the grounds that the legislature can send the proposed new standards back with instructions to the board. HB 3399 will allow the board much more input into the education of Oklahoma’s children than the 2010 Common Core legislation did. “Today the Supreme Court ruled that House Bill 3399, which repeals Common Core and directs the state of Oklahoma to develop new academic standards, is constitutional in its entirety. This bill has now been passed with large legislative majorities, signed by the governor, and reviewed by the courts. It is now time for parents, teachers, school administrators and lawmakers to work cooperatively to implement this law. We need all parties working together to ensure that Oklahoma's new standards are rigorous and can be realistically integrated into the classroom. Working together, I know that we can design Oklahoma standards that live up to a level of excellence our parents and students expect and deserve." Thanks again for all the hard work you put in on this! God bless you!